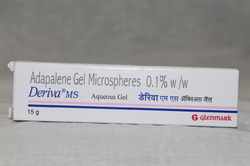 Pioneers in the industry, we offer deriva ms gel from India. Deriva Ms. Aqueous Gel Is Used In The Treatment Of Acne. Deriva Ms. Aqueous Gel Is A Form Of Vitamin A Which Treats Acne (Pimples). It Works By Preventing Accumulation Of The Sebum (Skin’S Natural Oil) Which Unblocks The Pores And Allows Natural Exfoliation Of The Outer Layers Of Skin.